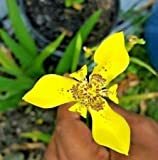 Yellow walking iris growing herbaceous geophyte of the genus Trimezia also known as Trimezia steyermarkii, Yellow walking iris perennial evergreen used as ornamental cut flower plant, can grow in tropics, mediterranean or subtropics climate and growing in hardiness zone 9+. Flower color: light yellow, the center is purple dots, the flower has 6 petal, 3 in the outer circle, 3 petal in the inner circle. 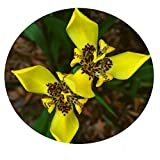 Light yellow flower, the center is purple dots, the flower has 6 petal, 3 in the outer circle, 3 petal in the inner circle.